At 750000 miles warranty kinda hard to say how good it is but I’m sure it’s as great as all the other hotshot products. I use them all religiously. You may use the 750K in the 2013 Ford Escape. However, we recommend NOT adding more than 10% of the total volume if mixing. 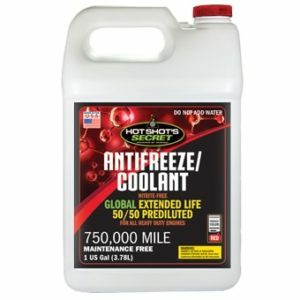 Even though the MotorCraft Anti-Freeze and the Hot Shot’s Secret Anti-Freeze will mix together and are compatible, when mixing additive packages, you may not get 100% protection. If you are planning on adding more than 10%, we recommend flushing your entire cooling system and adding the 750K. Thanks James! Very pleased with all Hot Shot’s Secret products. I Highly recommend using them. Thanks! my 96 7.3 has to have an EG coolant, usually green, this being red does that mean its a PG coolant? Both our 150K and 750K coolants are Ethylene Glycol based (the additive packages are different). The 750K antifreeze will work great for you, Kevin! Hello! Yes, it would work, but would recommend the 150K Yellow Antifreeze. It is the same color and is also an HOAT…thanks! Why can this only go in diesel and not gas engines? Hi Frankie, it can go in diesel OR gasoline, easily replacing any red/long life coolant…and more! I fell in love with hot shots product, stiction eliminator. It helped me love my truck again. Each additional product of theirs is improving my truck as they state. Is this compatible with dexcool just incase my flush isn’t perfect? Is this coolant HOAT, OAT, or IAT? Hi Wendall. It is a non-nitrite OAT. Used Stiction Eliminator in my 2003 Ford 6.0 Excursion, made a big difference. Awesome Products. Can this be used for my 2005 Chevy Duramax? Do I need to make sure I flush all fluids out first? Hi Mike, yes it is compatible…and yes we recommend a full flush before switching, thanks! Does this meet the requirements for the 6.7 Ford powerstroke engines?